This may come as a surprise to... well, absolutely nobody, really, but in my day-to-day life, I have a lot of conversations about Jimmy Olsen, and it was during one of these with my pal Scott a year or two ago when he said that Jimmy Olsen was "the best sidekick since Goebbels." And now you know the real reason I've been talking about this issue for three days. 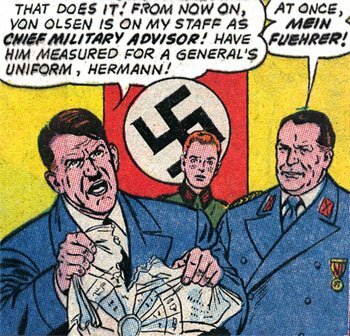 Because really, this is a comic book where Jimmy Olsen teams up with Hitler and that story doesn't even make the cover, and if that doesn't warrant three days of discourse, then I'm pretty sure Team America didn't either. Yes, it's Leo Dorfman and (who else?) 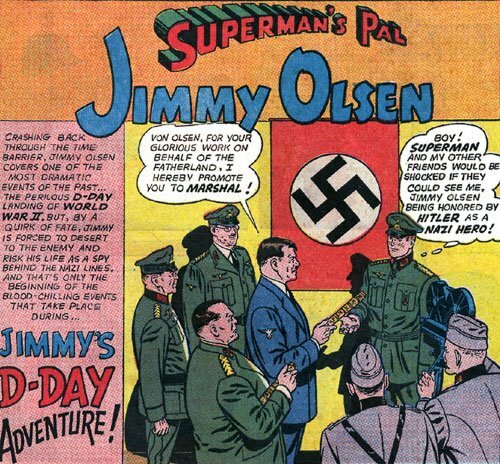 Curt Swan with "Jimmy's D-Day Adventure," and the whole thing gets started when Jimmy's visiting the Pentagon one sunny mid-sixties afternoon for a screening of captured Nazi documentary footage. One of the film canisters "accidentally" finds its way into Jimmy's briefcase, and being the kind of inquisitive lad who'll pop a reel marked "overexposed" into the projector just to check it out, he's surprised to find that it contains a film of someone who looks exactly like him hanging out with history's greatest villain and his pals. Clearly, this is going to require some time travel. 1. The fact that Jimmy doesn't immediately realize that going back in time means that it's going to be him in the picture and not his mysterious "double" means that he a) has absolutely no pattern recognition skills whatsoever, or b) is not that quick on the uptake. 2. As much as I like the idea of Silver Age Metropolis as a place where you could travel through time on less than a day's preparation, I'm actually more impressed by the fact that he was able to find that costume. Seriously, I'm not sure that I've ever actually seen a costume shop in my entire life, and yet Jimmy knows one that stocks fully authentic World War II correspondent uniforms. 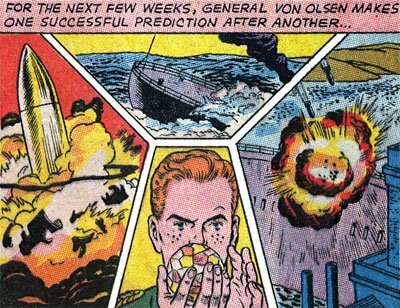 Anyway, to effect his travel back to The Big One, Jimmy employs one of Professor Potter's rare inventions that actually works like it's supposed to, the Time Bomb, which looks like a crystal ball, and, if separated from Jimmy, will leave him stranded in 1944. Both of these facts are apparent, but only one's going to turn out to be a plot point. One quick explosion later, and Jimmy's sent rocketing through the rainbow-colored time-barrier to Omaha Beach on D-Day, where he walks around thinking "What a thrill!" which, again, is probably not the right word to describe a battle that even the official 1st Infantry Division record describes as "a struggle for survival and rescue." Jimmy Olsen: Not Easily Impressed. 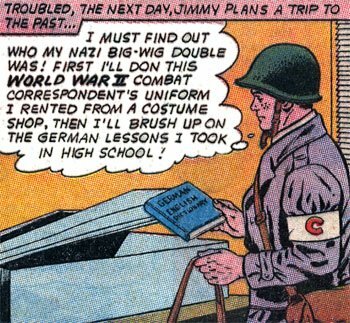 Just a reminder here: Not only does Jimmy think that the best course of action here is to draw attention to the one item that he needs to keep on his person to avoid beingstuck in Nazi Germany in 1944, but from one High School German class, he's able to pass as a Psychic Nazi Soldier. That is just how Mr. Action rolls. Yep: He's willing to take the risk of selling her out and condemning her to a horrible death at the hands of the Nazis because she is not wearing wooden shoes. James Olsen, you are cold as ice! And yet, the Ladies cannot get enough. 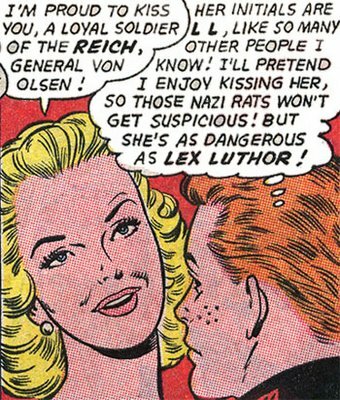 I think "I'll pretend I enjoy kissing her so those Nazi rats won't get suspicous!" just about sums it all up. And with that, pretty much any claim to legitimacy that Marvel Comics had on slapping the phrase "The Strangest Team-Up Of All!" onto a story where Ghost Rider teams up with Franklin Richards or whatever was blown out the window. More Adventures with Superman's Pal, Jimmy Olsen! Mike Sterling did his own write-up of this story back in 2005 (which I haven't read, to resist the temptation to steal his dulcet phrasing outright). Check it out, because seriously: This is the kind of story you're not going to mind reading about twice. I read the whole post and I still believe with reasonable certainty that you are not a Nazi. 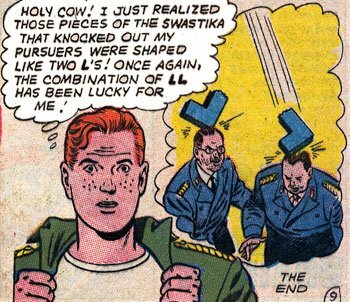 What's with this running "L L" gag in DC Comics? Now why didn't this become an on-going thing? Jimmy teams up with Stalin! Jimmy's close personal friendship with Pinochet! He could be the mass-murdering dictator's Pal! I remember reading that story when I was a kid! I also remember thinking WTF? You didn't point out the one thing that had me laughing out loud the longest, the -like -totally authentic german name of "Von Olsen" As we all know the way to make ANY name sound authentically german is to add Von to the front. That one became an inside joke to me and my comic book obsessed cousin for many years, calling people we considered fakers Von-Whatever and laughing hysterically. Yes, immature to be sure, but we were both just kids! Thanks for tweaking a childhood memory! I too was thinking, you can just stick a "Von" on the front of your name, and those stupid Germans are immediately fooled! Poor Ribbentrop tried the same thing, and was razzed mercilessly by his Ratzi Chums! Um...did nobody ever think to ask "Von" Olsen exactly where in Germany he was from? It wasn't that long that Germany had just been a loose conglomeration of smaller states, and they had a tendancy to be pretty territorial. Nevertheless, this is really stupid fun. You just CAN'T lose with a story about Nazis. Ah, if only Howard Chaykin had written this one: Jimmy would have been all over Lotte Lutz, but have felt really guilty about it. This one ended up crazier than Patterns of Force, and that's saying something. Can't help but note Bolland left Nazi Jimmy off of that trade cover, though. I think the craziest coincidence of all is that Jimmy happens to "borrow" that particular reel. The rest is, well...good comic book nonsense! At least Jimmy "loose cannon" Olsen has varying themes. Lois was ALWAYS trying to get Superman to marry her. Absolute insanity. I thought I had struck gold when I came across copies of Jimmy Olsen turning into a lizard giant, a wolf-man, and a porcupine. 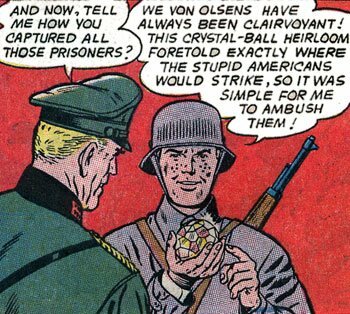 This however is a jewel of a Jimmy Olsen tale. I must have this. I didn't know WWII war correspondents wore armbands with the letter C emblazoned thereon. So this comic is educational. 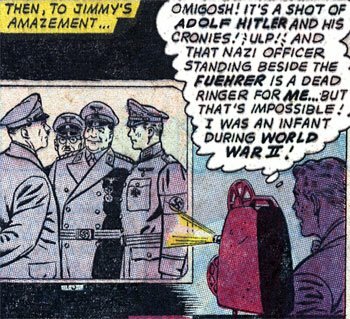 Actually the Nazis taking Jimmy's "psychic" predictions seriously is one of the more believable bits of the story. Various elements of the Nazi hierarchy took all sorts of ridiculous pseudoscience seriously. 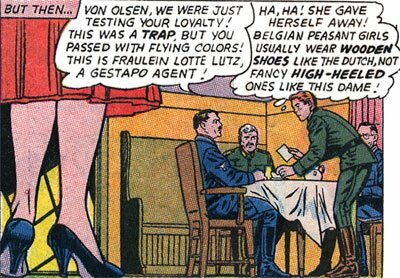 I like the detail that, preparing to travel back to WWII, he FIRST dons the combat correspondent's uniform, THEN brushes up on his German. Because I, too, find that I can't effectively study German in civilian garb. If Superman would have existed, Hitler never would have done the damage he did. He was the most terrible person I've never seen. I have hated Hitler since I was a brad, reason for which I can not understand how somebody is able to use this guy as a part of a story, when in the real life he was a monster, it's inexplicable. Friday Night Fights: Spell It M-I-S-T-Y! Friday Night Fights: A Monster Unleashed!